A very busy week has seen me not make great inroads into reorganising/refrugalising my life, but a few baby steps, nonetheless. For a start, I've managed to make my lunch every day, saving probably around a tenner. Before had seen me getting dropped at the station, grabbing something reduced price from M&S for the next day (because I knew I would be too tired to bother), and hoping I could get through to a mini cab company for the journey home, as black cabs are an arm and a leg. Good news, this week I am in shoes! 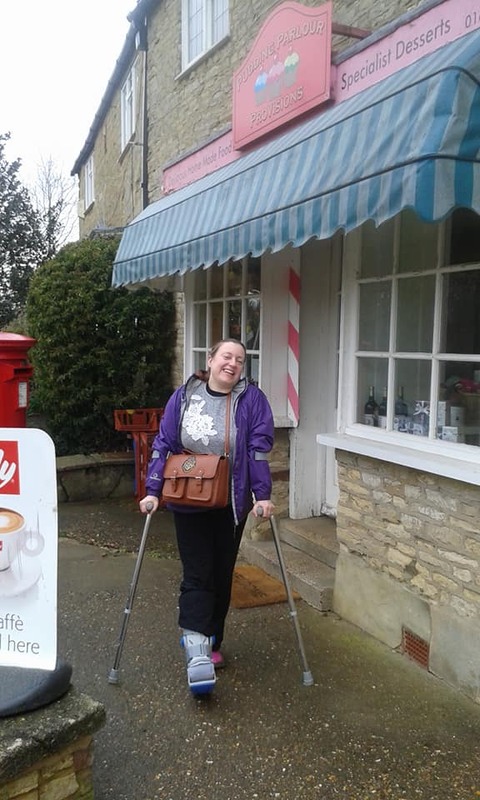 My physiotherapist gave me the all clear to ditch the boot -- if I could -- about ten days ago, but I couldn't get into anything for a few days so had to keep the boot on to go to work. My foot is less swollen now, but still a bit bigger, and it's a bit less pronounced now, but my ankle is like the hip on a rose at the end of summer. Lace up pumps are the only shoes I can wear. I don't think I'll be able to war my Mary Janes or my Doc Marten boots for a while. This week, I have managed to walk to the station on 3 out of 5 days, and get lifts the rest of the time. Trouble with getting lifts though, is I am susceptible to agreeing to not drive home straightaway, and that has seen us drive by a beer garden to appreciate the heatwave and get takeaway on the way home. Uh oh! My peak steps on Saturday were 10.9k, but that was a mistake doing that much as I was in agony after. I am settling down from the usual night pains, but I felt sore after yesterday's home physio session too, and it's making me wary of moving. Still, every day, more control, but I still can't do everything I want/need to do and it's frustrating. I was worried about my allotment, but my friends have promised to come help in a couple of weeks, which is awesome! I am so happy knowing I'm not going to lose it. Broken ankles are the enemy of frugalling! I saw 20p on the floor yesterday and I couldn't sodding pick it up! I went to see my friends' play Madam Bovary: a madcap tragedy at the Playhouse Theatre. It was excellent! Lou Chawner played Charles Bovary and the salesman. He broke his ankle too a few weeks ago (plagiarist! ), so had to play with some retro under-elbow crutches, but even though this was a very physical production he was awesome in it. Nice one, Lou! Brilliantly cast as the lead was Julia Langley, who I told "gave good face" -- she does! She was excellent in The Rover too. I think she's a comic natural. My friends did brilliantly with the fantastic bed and mirrors-centred set design, puppets, staging, everything. Even ribbons were used with skill. Lovely, lovely night! 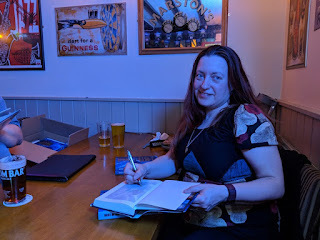 I also met up with my writers group, and got to finish signing copies of my antholgy for future sale and pick up my contributor copies. This is the happy face of a woman who loves practicing her autograph! Might blog again very soon, about something that's been in the news loads lately. TBC! A week after coming back from Eastercon, my ambition to recount the weekend in lots of detail has failed as I've had to do other things. 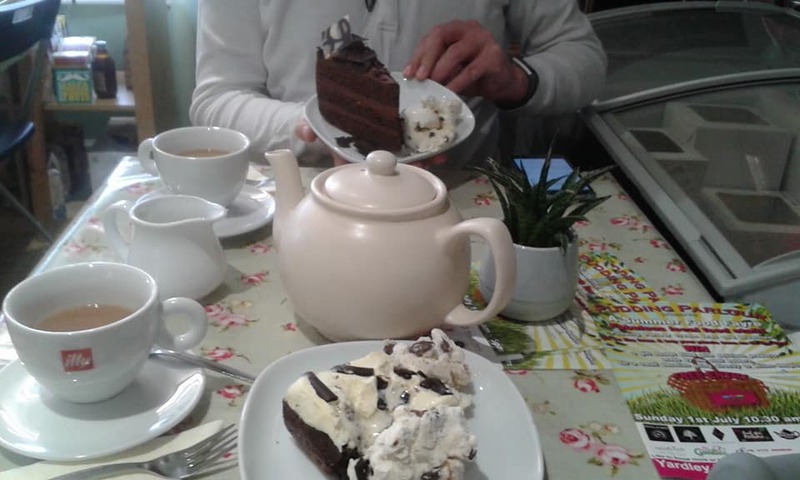 Plus, as I have been walking a lot more, I also need a lot of recovery time. My Fitbit has been recording from 3-5K, but as I ventured out today, I noticed it hasn't always been recording properly. All I know is, I ache. Anyway, I should at least mention the highlights from last week, and apologies, it's not really the usual stuff you might read here. On Friday, I launched a book! My book! Specifically my latest anthology: The Best of British Science Fiction 2017. This was immense. Mine wasn't the only book being launched, and I know pretty well that I wasn't the draw in a room with some pretty awesome authors, but it was such a buzz to see the launch room pack out. People got turned away because the room was so full! And on Saturday, Chad Dixon took this photo of me controlling the presentation slides for the BSFA Awards. Woot, yes that's my wine! 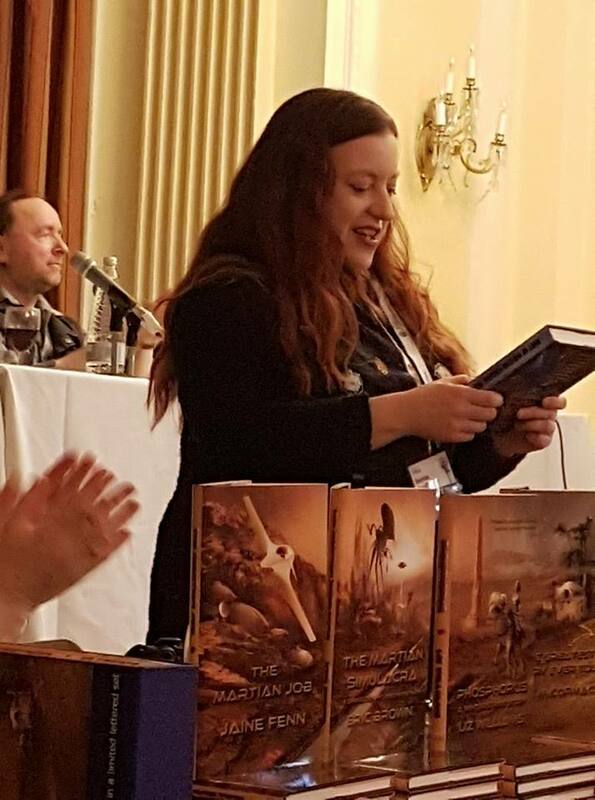 I had a panel on Sunday to talk about the BSFA being 60 this year. 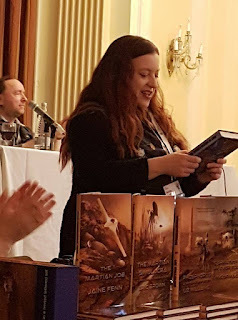 I was moderating, accompanied by previous chairs Kev McVeigh and Joseph Nicholas, BSFA Review editor Susan Oke and previous award winner Jaine Fenn. It was quite a tough panel to be on with lots of strong opinions in the room, but very interesting. I had more wine for that one. I had a great time in between those things, having long chats in the bar with my friends, or in the dealers room where I was on the BSFA desk. Access was a bit of an issue in the Majestic. When I felt up to it I coped with the stairs to the dealers room, but in the mornings I just couldn't, so a man called Stan would whizz me round to the step-free entrance by the art show on a golf buggy. He was a demon driver and then some! We normally save up for the year and make conventions our holiday, though they are also quite work-filled things too, but I usually pride myself on being super-prepared. Sometimes these things cause you to be trapped in a very expensive location, so we have learned to take supplies with us for the lean times between panels. We also try to make the most of where we are. 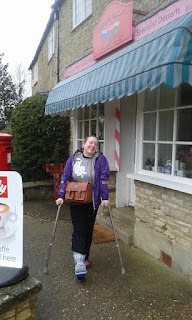 This year, with my broken ankle, we found ourselves in a lovely place that we couldn't take advantage of so much, and I did not feel prepared either. But I still had a great time. Normal bloggery will resume again soon.